Do you have Citrix or Windows RDP servers, and your users keep calling you because of problems? The first problem is to see which server the user was connected to. 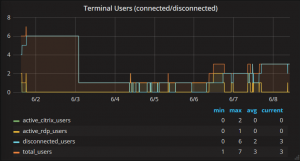 I solved this problem by monitoring the user connections on Windows Terminal Servers (including Citrix Servers), so that you know how many users are connected or disconnected, and how long they stay on any of your servers. Query User is a standard Windows command and is always available. As seen above, you can also pass the LDAP server host/credentials so that the login names may be resolved into real names. You should do that only if you use the –verbose switch. Otherwise this is not needed.